It's been a great spring for the color purple. The redbud trees are in full bloom and looking glorious in the central part of the state now. 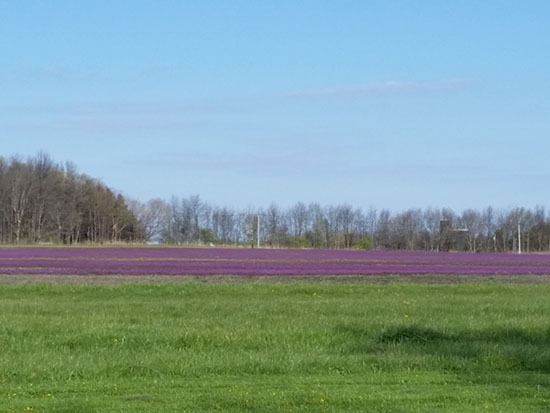 But for several weeks, the ground has been purple as well due to a few cool season weeds that seem to be enjoying the moderate temperatures we've been having. Henbit (Lamium amplexicaula) has perhaps been the most noticeable as it covered acres and acres of fields. It's starting to disappear however as the fields are now being sprayed, tilled, and planted. This cool season annual or biennial is generally low growing but can grow to 16 inches tall. As a mint, the stems are square shaped (4 sided). Additionally, stems are green to purplish, and may be smooth or hairy. The leaves are triangular to circular in shape and have palmate venation with a deep crinkle along the veins. The leaf edges have rounded teeth. Upper leaves are borne directly on the stem, while lower leaves are found on long petioles (opposite each other). Leaves are typically 1/2 to 1 inch long and hairy. They often begin as a dark green but tend to lighten in color as they age. The roots are fibrous. 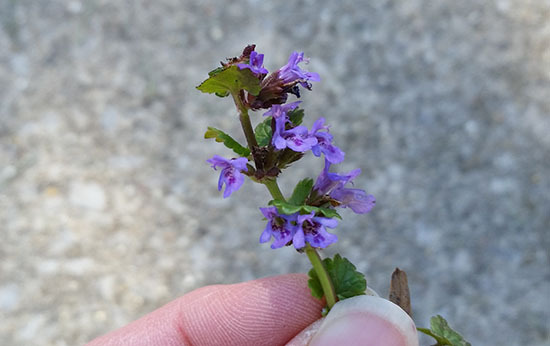 Henbit flowers are tubular, up to 3/4 inch long, pink to red to purple, and borne in whorls in the upper leaf axils (where the leaves meet the stems). To me, they look like pink puckered lips. 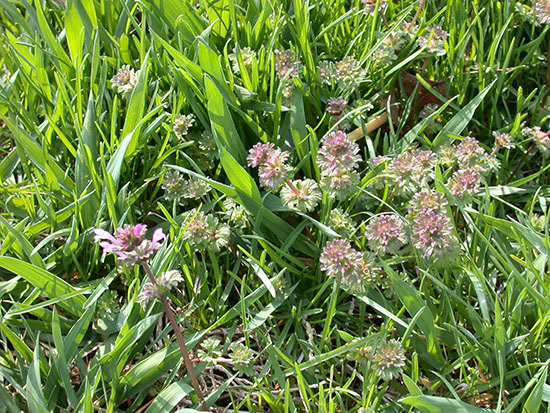 Henbit normally produces flowers April to June but can sporadically until fall. Reproduction is by seed and by rooting stems. Purple deadnettle (Lamium purpureum) is a winter annual with triangular shaped leaves which are less deeply lobed than those of henbit. They are attached to the stem by a short petiole. An important note is that the leaves and stems are often conspicuously red or purple which lends to the plant's name. 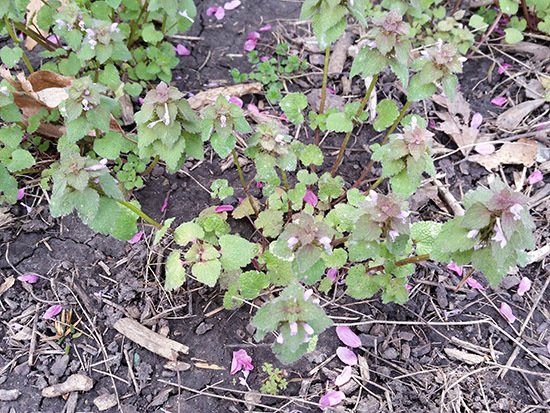 This plant looks very similar in overall growth and leaf shape to spotted deadnettle, a perennial groundcover that has white markings on the leaves. 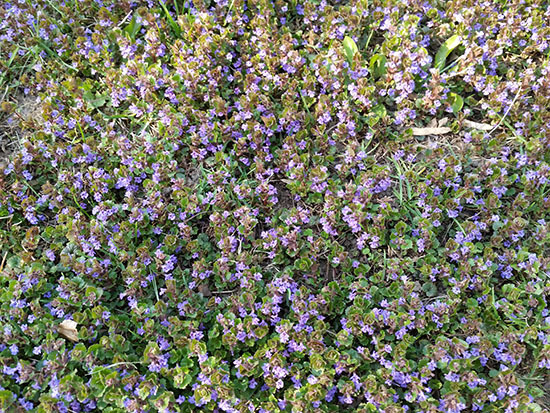 Groundivy (Glechoma hederacea)is another low growing weed with a purple flower. Commonly found in lawns and landscapes, it may be difficult to control but it is actually quite pretty when in full bloom. Also known as creeping Charlie, this plant is a creeping perennial with smooth (sometimes hairy) leaves in pairs on long petioles. Leaves are ½ to 1 ½ inch in diameter. The leaf shape is round to kidney-shaped with a rounded toothed margin. The color is medium to dark green. Groundivy emits a minty odor when crushed or mowed. Flowers appear April to June and are small, lavender to blue-purple, and funnel shaped. They are found clustered in the leaf axils. Common violet (Viola spp. 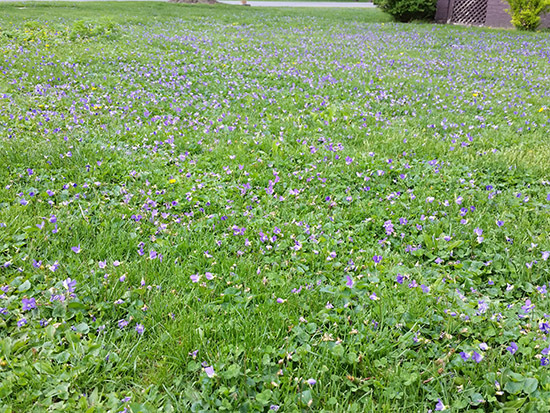 )> is a common lawn weed that many are familiar with. 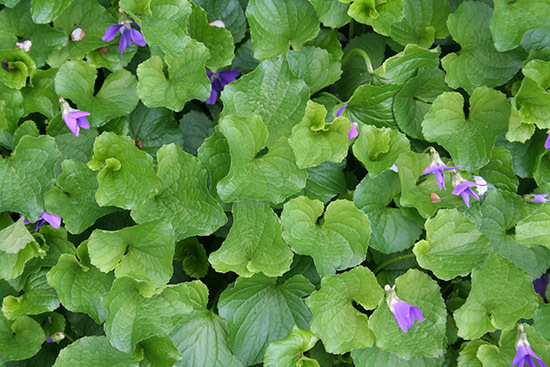 A dense stand of violets in bloom can be striking. This cool-season perennial spreads by seeds and by creeping rhizomes. The leaves are kidney-shaped to broadly oval, with a heart-shaped base and a pointed tip. The margins are typically toothed. Leaf size is 2 to 4 inches. Stems are low growing typically but can reach 12 inches in height. Many colors of flowers exist from white to blue to purple to yellow. Cultivated types exist as well. Violet blooms early in the spring.